Esa-Pekka Salonen, who directed the Los Angeles Philharmonic for 13 years and in that time made it an orchestra of top quality, has come to Boston to exhibit his accomplishment as a composer — a rare enough capability for conductors today. In this way he continues a distinguished tradition of composers who made a substantial and even principal part of their living as orchestral conductors — Mendelssohn, Richard Strauss, and Mahler are the outstanding examples in the 19th century, while Britten, Bernstein, and Boulez are those of our own time. 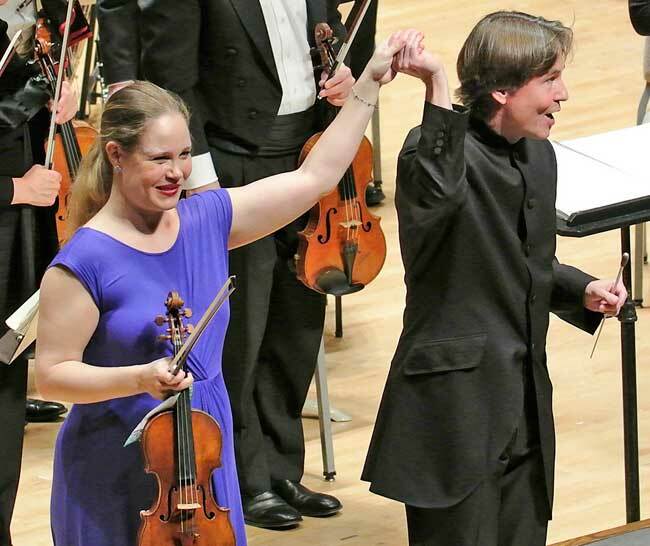 I was especially eager to hear Salonen’s three-year-old Violin Concerto written for Leila Josefowicz, who played tonight’s electrifying solo performance from memory. The concerto is in four movements, alternating fast and slow, or more realistically, frantic and meditative. In the first movement, “Mirage,” the soloist is bowing fast 16th-notes at high speed almost throughout, occasionally relieved by orchestral answers in the form of widely-spaced chords full of open fifths with a lot of B-flat, “zoom in” and “zoom out” as the composer’s notes emphasize, eventually gravitating to an open D string. The second movement, “Pulse I,” has a slow, penetrating timpani beat, surrounded by rich divided strings in close-textured, complex, and elusive harmony, spread out over the entire range; here the solo violin is melodically expressive. There were 14 gongs in the percussion section, and I could see them moving, but from where I was sitting I couldn’t hear them at all. I wanted more of this relatively calm music, but the third movement, “Pulse II,” interrupts rudely with what the composer describes as “bizarre and urban” sound, heavily percussive with big crunch chords in orchestral tutti; the angry violin, with renewed rapid motion, seemed to be fighting every step of the way. Impossibly high notes in the horns — high G, I think — were like shouts in a crowd. And then bang! It ends suddenly. There was enough of a pause to allow the soloist to tune again, surely necessary after such furious playing. But the fourth movement, “Adieu,” I felt was the most expressive and the most successful, in terms of what one expects from a violin concerto in which the orchestral complement often seemed to be too large even from the start. The composer’s notes state that he “tried to illuminate the harmony from within.” In this he surely succeeded, because the harmony is as well organized as it is rich and even lovely: widely-spaced chords of sevenths or ninths moving in parallel by whole steps, others in fixed position alternating with an E – B-flat bass, and an orchestra distribution that was often striking — I remember a fine texture that I think was three solo violas and three solo cellos. Often I heard the solo violin trading unison notes with solo winds in the orchestra, and I wondered whether Berg’s famous violin concerto had exerted some influence over this one. The harmonic shift at the end — Salonen’s program notes call attention to it — was luminous and I can’t wait to hear it again. After the intermission came Stravinsky’s Zhar-ptitsa (I give the Russian for Firebird only to spite the many publications, including the old BSO program, that use the French title). For over 50 years, I have known the complete 1910 ballet from recordings, especially Antal Dorati’s remarkable London Symphony version (Mercury Living Presence), but I had never before heard the whole thing live. “The orchestral body of The Firebird was wastefully large,” Stravinsky wrote in 1962, and this is doubtless the reason for the infrequency of concert performances. The 1919 Suite is more practical, because its orchestra is smaller, but it omits a great deal of excellent music — the Supplication music, the Princesses and the Golden Apples (which Stravinsky claimed he could never get quite right orchestrally; but I think it’s perfect), the Magic Carillon (Salonen took this part too fast), the shattering trombone-glissando arrival of Kashchei the Immortal, the Firebird’s reappearance just before the Infernal Dance. I was interested recently to read, in the latest redaction of the Stravinsky-Craft conversations, that Sergei Rachmaninoff told others (but not Stravinsky) that he considered The Firebird to be the greatest work of music yet composed by any Russian. There’s no doubt that The Firebird brought Russian music fully matured into the 20th century, when its composer was only 28 years old. The Boston Symphony coped with the orchestral difficulties as if they didn’t exist. There was some particularly fine solo playing, especially the first horn, first bassoon, and even the first harp, whose delicate harmonics were perfectly clear. The high-register F-sharp for piccolo is very difficult to play pp as marked in the Khorovod; here it was wonderfully soft and perfectly tuned. At Kashchei’s Death (no. 190 in the score), there is a vague instruction: “Rub the bass drum with a brush.” I think this is supposed to be done with a wire brush on the drumhead, rather than with a switch (Rute) on the shell of the drum — but I could very well be wrong. Tonight’s performance of The Firebird was vivid confirmation of what the most brilliant young composer of his time could accomplish. Esa-Pekka Salonen doubtless chose it as a significant demonstration of what he can do as a conductor, and the audience reacted with an enthusiasm which was well deserved. If I thought that his conducting was sometimes excessively theatrical, I recognize that The Firebird is well suited to that excess and I enjoyed it heartily. Salonen’s conducting in his own work was much more restrained and precise, even when it called for big and complex gestures at times. I haven’t even yet mentioned Ravel’s Le Tombeau de Couperin, the orchestral version of four of the original piano suite of six pieces, which opened tonight’s program. It was marked by some fine solo playing, especially by the first oboe; and from where I was sitting I could actually watch how the double basses play those tricky natural harmonics in the Musette of the Menuet. Salonen conducted this piece expertly without a stick, using his fingers with precise expression. This is possible when the orchestra is smaller (I counted six cellos and six basses, but the rest of the strings seemed full). I don’t mean to underestimate Salonen, but under Carlo Maria Giulini, the LAPO sounded wonderful and deeply musical. Or at least that’s what I can hear in some of their recordings from the 1980s. Did they decline under Previn? *The LA Phil was always a terrific orchestra — how could you _not_ be in the home of all those great studio orchestras of 50-60 years ago. It’s a question of conductors simply bringing the best out of that raw talent. *Weren’t all of those Bruno Walter recordings with an entity called the Columbia Symphony Orchestra performed by L.A. studio musicians? *I hope someone will review Friday night’s Discovery Ensemble concert at Jordan, which featured Salonen’s “Mania for Cello and Chamber Orchestra” among other delectable fare. Yup, a contract orchestra of LA Phil and studio musicians, who recorded at an American Legion hall in Hollywood. Not to be confused with the New York “Columbia Symphony” that recorded in Manhattan Center, CBS’s 30th Street Studio, and at the ballroom of the St. George Hotel in Brooklyn. I thought Salonen is a prominent figure. But not much attention here. I have attended since 1959.
the musicians, when challenged and inspired by a conductor like Salonen love to play well. The audience too went wild with enthusiasm.